Srinagar: In its first major violation of the border ceasefire after cancellation of the NSA level talks, Pakistan Army on Tuesday resorted to unprovoked firing on the Line of Control (LOC) in Jammu and Kashmir, killing an Indian soldier, officials said. "Pakistan army resorted to unprovoked firing at Indian Army's Badal post on the LOC in Nowgam (Kupwara) sector today (on Tuesday). A soldier of the Kumaon Regiment was killed. 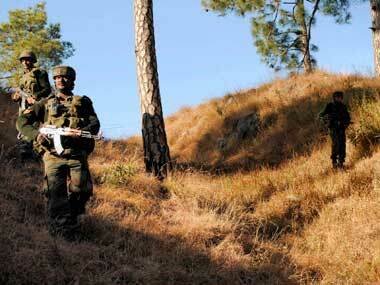 Indian army effectively retaliated to the Pakistan firing," a senior police officer told IANS in Srinagar. After Pakistan had also violated the ceasefire a day after the NSA level talks were called off, in Balakote sector in Poonch district. As, a gunfight between security forces and militants was on in Lasipora forest area near the LoC in north Kashmir's Uri sector, officials said. This ensued as army and special operations group (SOG) of the state police rushed to the area, following information from some shepherds who had complained to police that some gunmen had snatched their mobile phones and identity cards there. "Firing exchanges between the hiding militants and the security forces have started in the area," said a senior police officer.